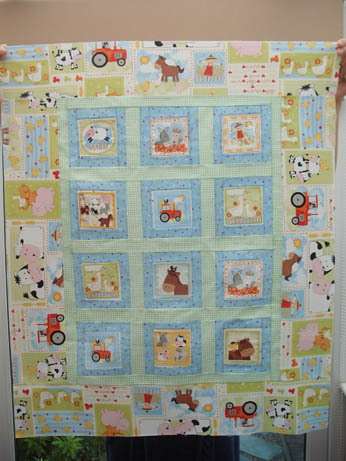 I am pleased to report that I have almost finished the Makower Farm fabric quilt in time to take it to Spain next week. In fact I do have enough time (and hopefully enough fabric) to make a little bag to go with it to keep all the animals in. Six of the labels have a pocket on them (made of an extra label with the same design shown on) and I have bought six little plastic farm animals to put into the pockets as well as a set of bigger animals. As this was my own design I have spent a lot of time trying to work out what I could do with fabric I had bought and would it have been much easier had I bought more plain and co-ordinates for sashing and borders but I will know for next time. I have just quilted the top and then made a ‘bag’ with the backing and turned it inside out, partly as I thought it would look better and partly as I was running out of time and fabric to do a border. I think it looks great as the outside border has enough pattern on it anyway. We have been for a few days out since Mum arrived at the weekend. 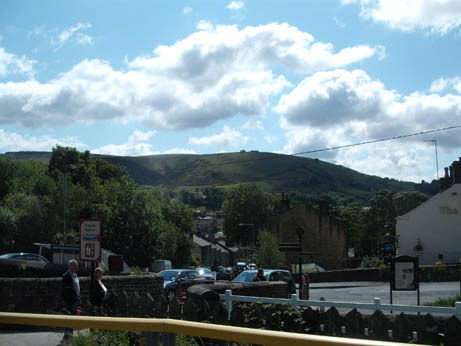 Firstly to Marsden which was lovely and sunny. 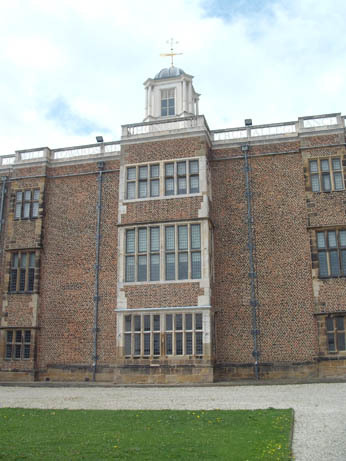 Then to Temple Newsam House near Leeds which is a Tudor and Jacobean mansion that was the birthplace of Lord Darnley who married Mary Queen of Scots. 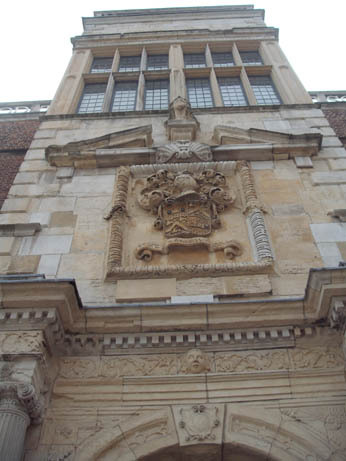 Lots of fab rooms and textiles inside , including some wonderful portraits, lots of embroidery spotting. 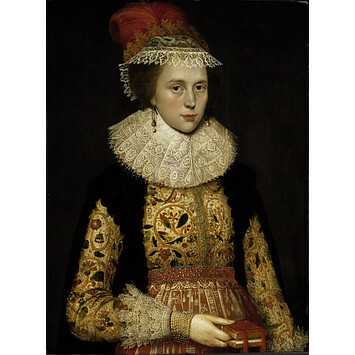 No inside pics allowed but I did find a copy of this pic of Arabella Stuart on this very informative website. 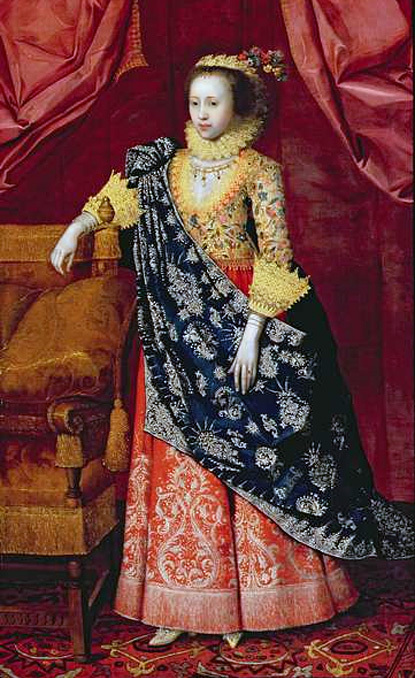 The jacket she is wearing reminds me very much of the Layton jacket in the Victoria and Albert Museum that I have written about previously. Below is a pic of Margaret Layton wearing the jacket.It makes me wonder about who made them both and how many more similar jackets exist – was it a popular design, did they know each other and did they ever meet (hopefully not both wearing their jackets!). They were both alive at the same time. There was also a very interesting quilt on one of the beds – no pics allowed so I will have to try to describe it to you and see if anyone has seen anything similar as I have never come across one like it before. It was made of glazed chintz, Chinese inspired flower / tree of life type designs so late 17th or early 18th century I think. It was patchwork but did not seem to be quilted, no wadding as far as I could tell and the patchwork design was of large squares about 14″ diameter set on point with half triangles at the border. I went to a quilt exhibition at the V and A last year and saw quilts there dating from the 15oos but nothing like this. 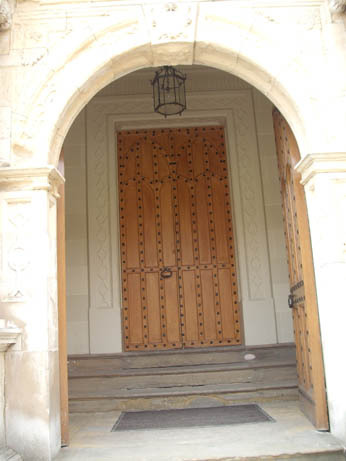 It looked quite basic, not really stately home style and I was very intrigued so if anyone knows anything about it please let me know. We have a trip to York to the latest Quilt Museum exhibition and the Minster planned for later in the week which will be lovely. Hopefully I will get chance to post again before I leave for Spain (with my completed quilt – hurrah!). Thanks very much for visiting, see you again soon. Apologies for lack of weekly post – have family staying so have been out and about and very busy so normal service will resume soon! The pics for this month’s Scavenger Hunt were all taken in a week on our recent holiday to London. I had set myself a goal of trying to get the whole list in one week – some of it was ridiculously easy while other words took a bit of searching but here they are and I hope that you like them! 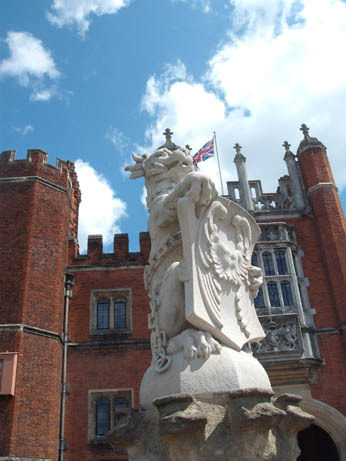 Being the capital city there were a fair few Union flags around – it is only called the Union Jack when it is on a ship – but this is one of my fave flag pics – taken at Hampton Court. 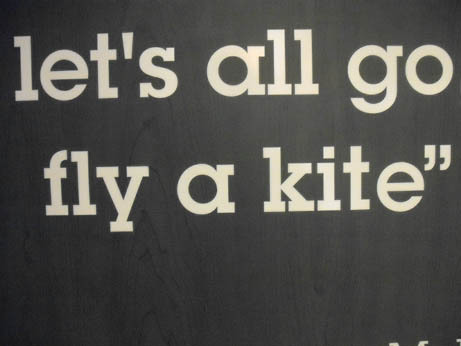 Had to be a bit creative with this one as did not see any but did come across this quote from Mary Poppins in the Disney Store on Oxford Road …. We are very big Disney fans in our house! 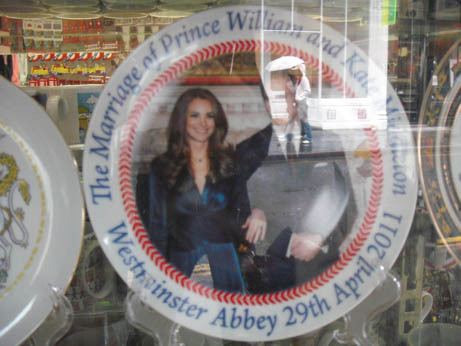 Being the capital city there are loads that take place here but thought I would share with you some of the memorabilia available for our latest one – the marriage of Prince William and the gorgeous Catherine Middleton on April 29th. 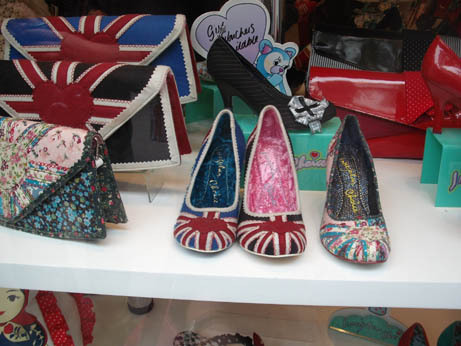 This pic was taken in a little gift shop round the corner from the British Museum on a very rainy day. I did buy a fridge magnet to take a pic of but thought this was a lovely pic as you can just see the reflection of tourists in the rain under an umbrella opposite the shop. 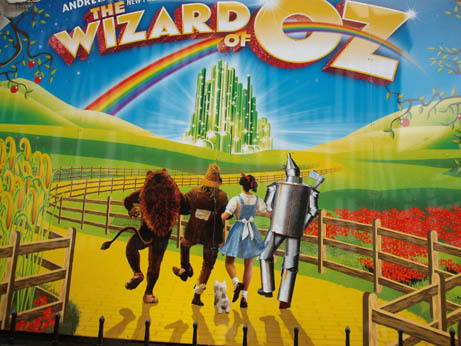 Again I had to be creative here as there aren’t that many in central London but we were in the theatre district and I saw this poster advertising the musical from one of my favourite films – how many Christmases did I watch this! Do you remember the bit where they fall asleep in the poppy fields? 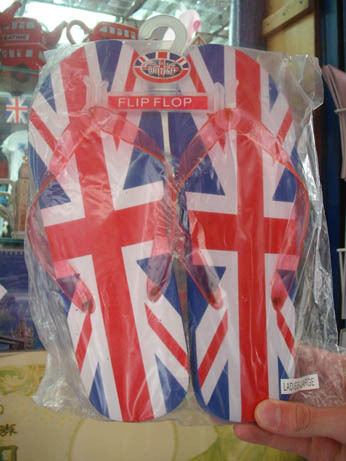 For when you are feeling particularly patriotic! 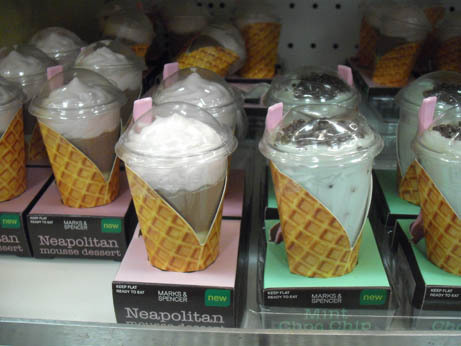 This is not actually ice cream but a little selection of takeaway desserts from Marks and Spencer where we bought our in train picnic for on the way back – how cute! and the patriotic US version ! Again this took some thinking about but then Ellie pointed out that Ariel the Little Mermaid has a bra made of seashells in the Disney film. 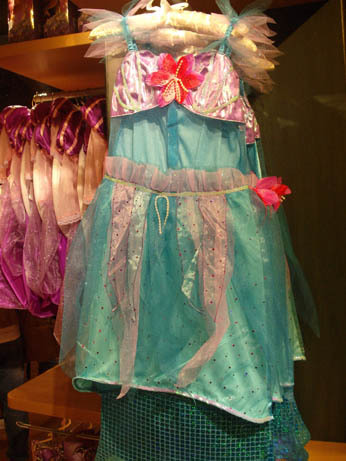 When Ellie was little she had a dress like this with a long fish tail which she loved.She is most upset that the Disney Store don’t do adult sizes! Well apart from my family and textiles the thing that makes me most happy is travel (if I get to travel with my family and there are textiles I am super happy!). I really love travelling by train especially as I think it is very exciting and though I use the train a lot I never get bored, I love just sitting looking out of the window watching everything go by. I am sure I would be a terrible driver as I am so used to being able to look all around when I am going anywhere and see all the pretty things. 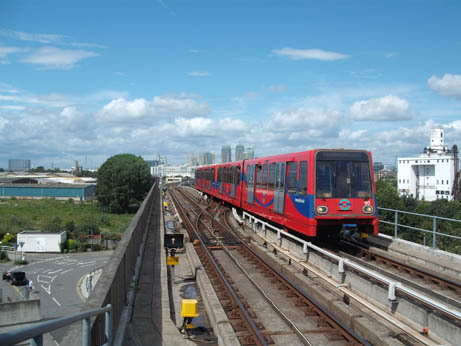 So here is a pic of one of the Docklands Light Railway trains that we used, the views from these of the skyscrapers at Canary Wharf were great – you can just see them in the background here. 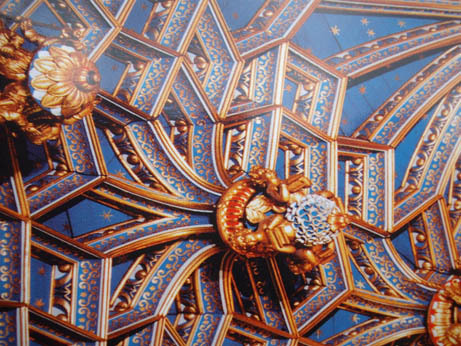 There was the most amazing ceiling in the chapel at Hampton Court decorated with stars – I couldn’t take a photo inside but here is a pic from the front of the guide-book. 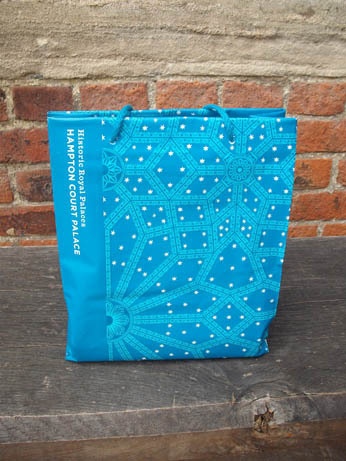 and then when we bought things from the gift shop the bag had this design on. 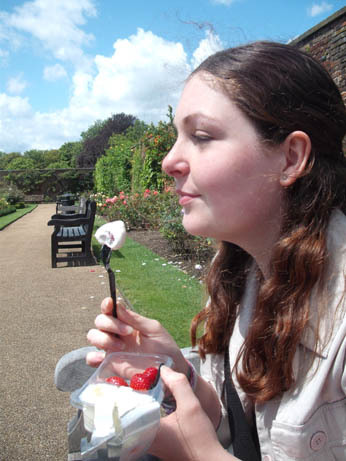 Here is Ellie enjoying strawberries and creme fraiche as part of our picnic at Hampton Court. 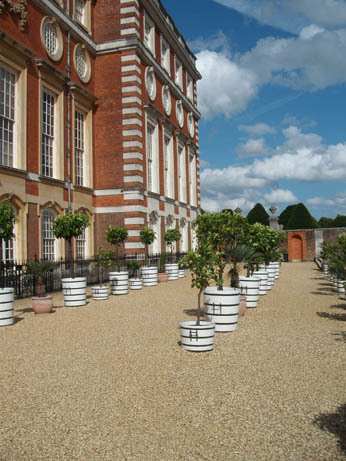 And some lovely pots lined up in the Hampton Court gardens. I do hope that you have enjoyed my pics – very much looking forward to seeing what other people come up with this month. To see the other Scavenger Hunt pics or to join go to the blog.